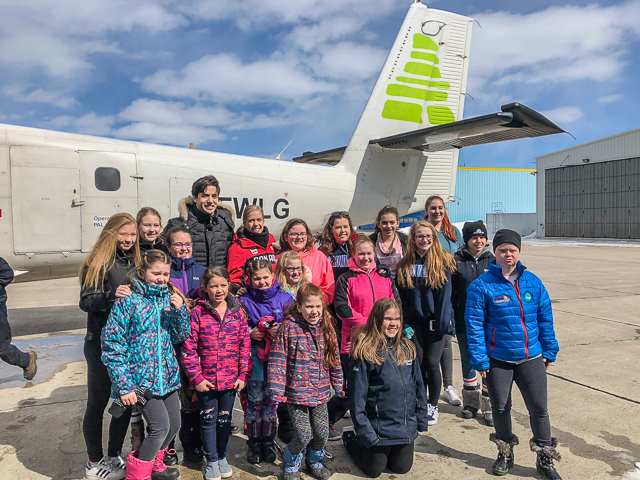 The way Kaitlyn Weaver and Andrew Poje planned it, they would have been happy to remain low-key, and chill out in their hotel in the off-hours during a spring visit to the very northerly Happy Valley-Goose Bay town in Labrador. They had come to Labrador’s largest community in the spring to do three shows and a seminar. Nothing was ordinary about their time in the twin towns of about 8,000 people, where access is best by air. The former world silver medalist ice dancers expected a fun time with the kids of Happy Valley. But they found so much more. For the shows, Weaver and Poje pulled out their costumes for their Olympic short dance, yet one more time. For the seminar, they brought their spit and polish. The kids – “millions of kids,” Weaver said – bubbled into the rink with excitement and wide eyes. They didn’t get to see skaters like Weaver and Poje every day. And that’s when the Olympians discovered that these budding skaters get 15-minute lessons once a WEEK. (And that’s only during winter.) Because there is only one coach, who also doubles as a school teacher, she just can’t get to every kid. “It was eye-opening,” Weaver said. They also can’t afford to go to Halifax to see a Stars On Ice show. The cost of living in the area is very high. Rents are high. The flights are expensive. And they have to fly. So Weaver and Poje gave them everything they had that week. They found perspective in that tiny northern settlement. The experience left a major imprint on their souls. Indeed, their entire spring and summer has been about living in all different ways. Weaver and Poje certainly found that in Happy Valley-Goose Bay. The children weren’t alone in greeting Weaver and Poje with open hearts. So did the local adults. Out for dinner one night with a local woman, they ended up talking about life. 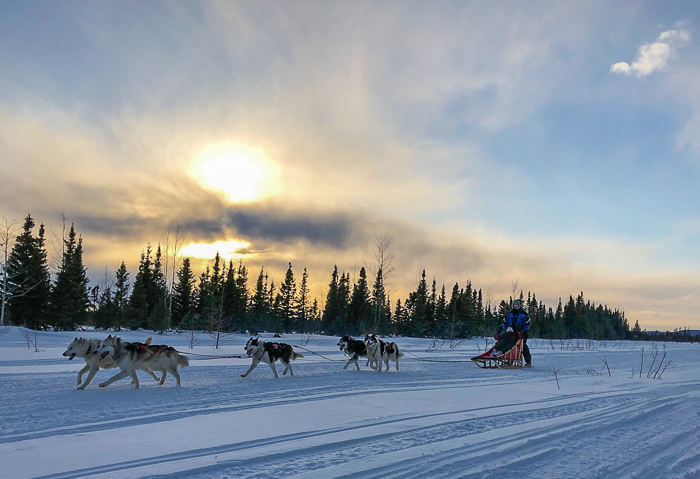 The local mentioned that she had gone out dog sledding and snowmobiling and all the sort of things one does in Happy Valley. “Oh really?” she said. “We’ll set it up. They had no gear. Snow blanketed the ground. It was bone cold. So the locals dug into their closets and clothed them with everything: big deep-treaded boots, hats, coats. 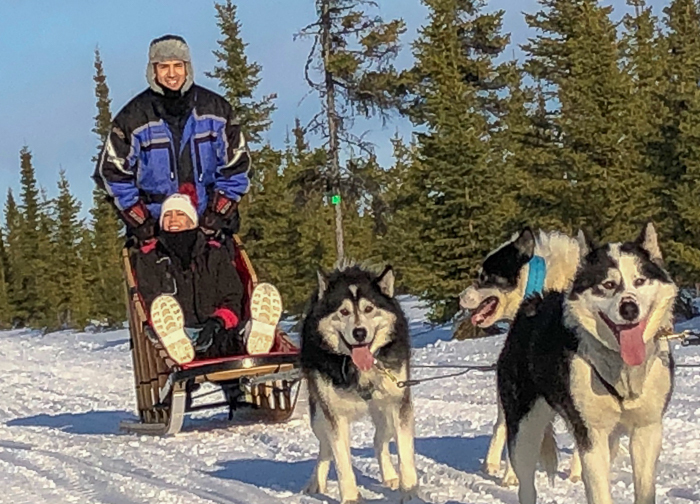 Out in the wilds, their new friends set up the dogs in the sleds. It was a fascinating sight. Winter wonderland everywhere. Happy-faced, eager huskies, blue eyes and all. It was “so cold,” Poje said. It was a buzz, just being out there with the dogs. “Wait, wait, wait,” Poje said. “I’m driving this thing?” Poje said. “Oh please, god,” Weaver said. Weaver and Poje have learned many new skills over the spring/summer. All photos courtesy of Kaitlyn Weaver. Weaver sat in the sled. Poje drove. They realized it was a once-in-a-lifetime opportunity. Not to be missed. To be cherished. Frigid wind in their faces. Peaceful valley in the middle of nowhere. Bustling dogs. Sun low in the sky. Gold streaks up past the horizon. The way it had all been for generations. They realized what they were being given. They took it. Oh the life. That’s Weaver and Poje sledding into the sunset. Their journey didn’t end with husky heaven. Their hosts were determined to get Weaver and Poje up in a prop plane, too. The skating club had a little contest and some of the children won a plane ride out of it. Weaver and Poje got to go with them. Did we tell you that the runway at Goose Bay is 11,000 feet long, enough to handle NASA’s Space Shuttle, if it needed an alternate landing site? (It never did.) Goose Bay was built in 1941 as a military air base. The day of one of the shows, up Weaver and Poje went in a tiny plane, with their knees up against the pilot’s seat. The pilot was the father of one of the students. Seriously, she thought they were going to do down at any moment. They returned intact. More than intact. And everything became clear to them. “We’ve learned that figure skating is not the be-all and end-all in life thing,” Weaver said. “It’s just a part of who we are and just a part of what our lives will be. So to do these life experiences gives us perspective to know we can bring that into skating. And then we can leave it there and live the rest of our lives. At this moment, before the Stars on Ice tour, they had been asked to be part of the ThankyouCanadatour, and they had said no, preferring to chug along in competitive mode. But their experience in Happy Valley tipped the balance for them in favour of setting aside the Grand Prix season in favour of the tour. 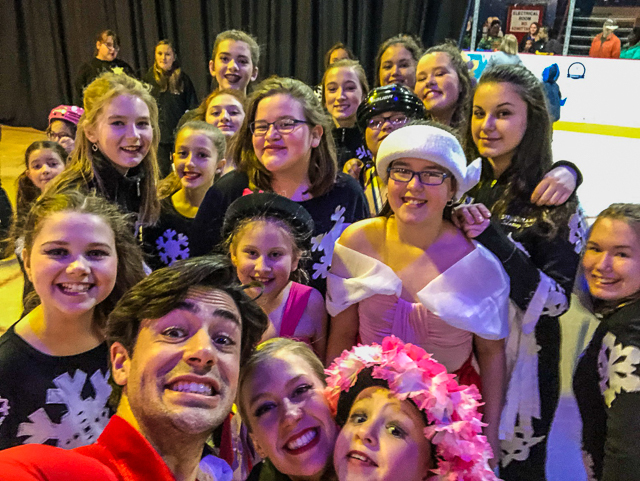 So when you see them going from small town to small town on the tour across Canada, Weaver and Poje will be skating with Happy Valley-Goose Bay in their hearts. Yes, the tiny town had made a huge impact. Thank you Beverley for this awesome article. Being from Labrador and my involvement with the Snowflake Skating club, it is nice to have such positive things shared with public. It was such a wonderful experience for the kids to be able to share this with Kaitlyn and Andrew. It will be a memory the kids will carry with them for a life time. Wonderful! The trip sounded rather life-affirming for them! Great story, loved it and so glad they are on the tour. Everyone will get to see them skate their competitive piece, which is WAY more fun to see that typical show skating! By the time they do it to 40 sold out crowds, it’s going to be amazing in competition!! Good decision. Thanks for the kind comments. Time after time, Weaver and Poje give me some of my best stories.